It’s not that de Rújula’s book was a bad one, but he just wasn’t able to think his way into the reader’s mind. He kept saying ‘physics is fun’, but he was talking about the fun a professional physicist gets out of doing it – which is a very arcane, often highly mathematical, type of fun. The result, for a non-specialist reader, was actually quite alienating. Mee, on the other hand, understands exactly how his readers think, what they find interesting, and the details that – no matter how important they are to physicists – are so abstract they’re best skipped over. 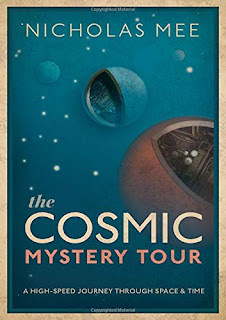 The book’s title, ‘The Cosmic Mystery Tour’, is a highly appropriate one. It really is a whistlestop tour, flitting at breathtaking speed from one idea to the next. There are a couple of dozen main chapters, but each of these is divided into numerous subsections, many of them a page or less in length. 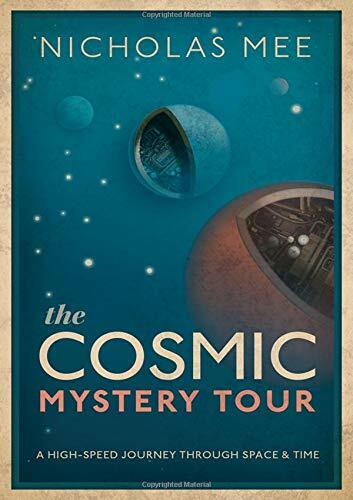 Unusually for a book of this type, the narrative is distinctly nonlinear – so, as with any good mystery tour, you never know what’s coming next. Opening the book at random, we find Thomas Young and the Rosetta Stone, followed by the double slit experiment, followed by de Broglie’s electron waves, followed by Julian Voss-Andreae’s amazing quantum sculptures, followed by electron microscopes, followed by the Large Hadron Collider. And that all happened in just five pages (pp. 12-16). Here’s another random five-page dip (pp. 138-142): a Chinese earthquake detector from the Han dynasty, gravitational waves, neutron stars, gamma ray bursts, the periodic table and Tutankhamun’s gold mask. As someone with a notoriously short attention span, I really appreciated Mee’s fast-moving style. It’s a completely different take on the ‘physics is fun’ theme. While de Rújula emphasized that doing physics is fun, Mee makes communicating physics fun. He does it in an impressively eclectic way, too. The illustrations include van Gogh’s Starry Night, the cover of Joy Division’s Unknown Pleasures (featuring the radio signal from a pulsar) and a scene from John Adams’s opera Doctor Atomic, about Robert Oppenheimer and the Manhattan Project. This is a great book for the target audience – non-specialists looking for a pain-free introduction to the physicist’s view of the universe – but it will also appeal to readers who are already familiar with most of the material, and just want a relaxing and entertaining read for a couple of hours.